Synthetic Underlayment vs. Roofing Felt | Acura Roofing Inc.
For decades, roofers have installed a layer of felt over the decking before installing shingles. But there’s a new kid on the block – synthetic underlayment. 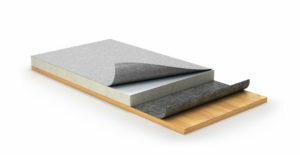 One of the advantages of a synthetic underlayment is its sturdiness over felt, that is, it has a higher tear strength than roofing felt, even up to 12 times stronger, a manufacturer claims. Another huge advantage is, synthetic underlayment comes with different grip strength and a light surface for easier install. Synthetic underlayments offer enhanced durability and water-resistance and isfinding increased use in roofing. Made with long-lasting materials, synthetic polymers have high strength and longevity. It is impervious to moisture and provides for wrinkle free installment.